I just returned from a vacation house where my one-year-old was far more infatuated with the staircase than the dock or beach. He required constant and close supervision as he crawled up and down an old set of tall, narrow steps. 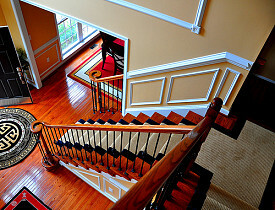 Stairs are a favorite for small children, but they can be a safety hazard, as can balconies, decks and railings. The Centers for Disease Control estimate that falls send 8,000 children per day to emergency rooms. Here are the best ways to make stairs, balconies, decks and railings safer for children. Add childproof safety gates at the top and bottom of the stairs. Look for gates that attach with hardware and screws long enough to attach to the house framing -- toddlers are surprisingly strong and can tear a safety gate out of weak drywall simply by pulling on it with their body weight. Swinging gates are better than accordion gates, which can trap a child’s head. Lock any doors and other access points to decks, where railings may pose a hazard. "Having the gate close automatically is definitely important," says DIY enthusiast Miriam Illions, in a post on Hometalk. Railings and balusters should be less than four inches apart, according to present code. There also should not be gaps larger than four inches between the floor and a railing. However, railings in older homes might be significantly farther apart. Ideally, these railings should be replaced. If that is not practical, or to further childproof an indoor balcony railing, consider installing a Plexiglas or clear plastic shield. Plastic mesh netting also is available for outdoor balconies. Railings must be at least four feet tall, according to the American Academy of Pediatrics, and should always be vertical. Children may use horizontal railings as ladders. On the other hand, short handrails on stairs can help children learn to safely climb them. Make sure the stairs are well-lit. Hire an electrician to install light switches and night lights at the top and bottom of the staircase. The night lights ideally should have emergency battery backup in case the power goes out. This will help you safely carry small children, and help older children navigate the staircase. Slick hardwood can be dangerous on stairs. Add non-slip pads or stickers. Carpet also typically provides more traction. However, loose carpet on stairs also can be a trip hazard. Close stairs with open risers. Children can slip through these steps. Don’t wax the stairs, landing or deck. Waxing could make these areas more slick and dangerous. It is tempting to deposit belongings on the stairs to carry on the next trip up or down the steps, but children can trip over these items. Train kids to avoid leaving their toys on or near the staircase, as well. Also, children might climb onto toys, planters and other items on decks and near railings, and may topple over the railing. Regularly check decks, stairways and balconies for loose railings or boards, and splinters or exposed nails. Steve Graham is a Networx writer.